The prettiest of the nightshades, in my opinion. 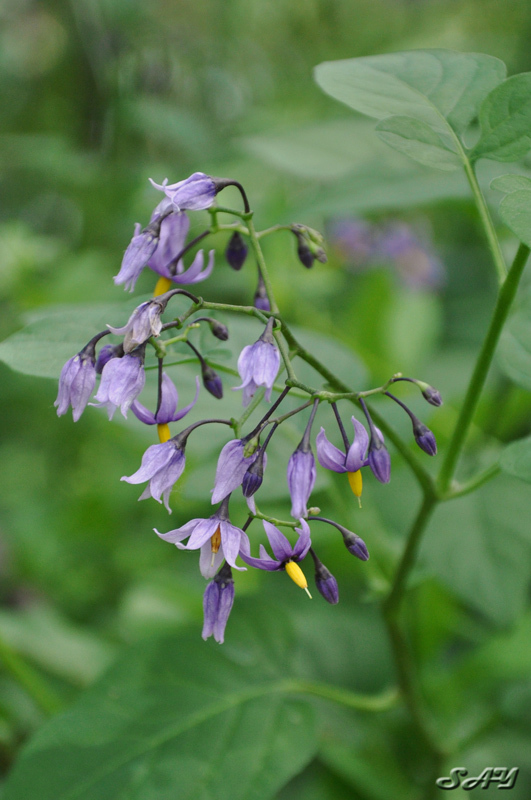 There was also a patch of white deadly nightshade, but I didn't get anything worth keeping of it. oh cool. I have some of this in my backyard and have photographed it often. It's irresistible. Irresistible is right! I have lots of shots over the years of this stuff, though no good ones of the white varietal. I'm waiting for that short window when there are berries in all stages (green to red) plus flowers. Seems like there's always a couple of weeks late in the growing season. I took some of flower and berries yesterday despite hurricane winds (all wind looks like a hurricane through my macro lens! : ) ) and will post them shortly. A tiny bumblebee came by while I was doing this and they get really excited over these flowers. It was a neat moment to watch. Anyway...post coming in a sec.